9220 * GRIMMER WILSON KEY:(14KB) Made in Canada, Suspiciously similar to McElroy Stream Key. A chromed mechanism key and a grey wrinkle-finished tear-drop cast base with the words GRIMMER WILSON cast into the bottom of the base. 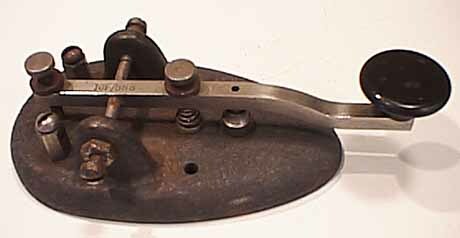 Lever stamped 10B/556. 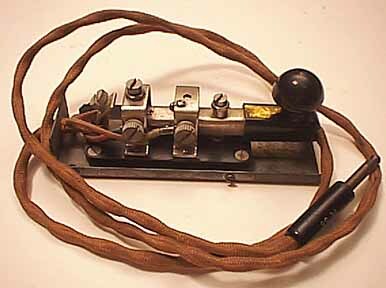 9230 * GRIMMER WILSON PRACTICE SET:(13KB) This set consists of a telegraph key with the same style of lever used in the Grimmer-Wilson Key described above. 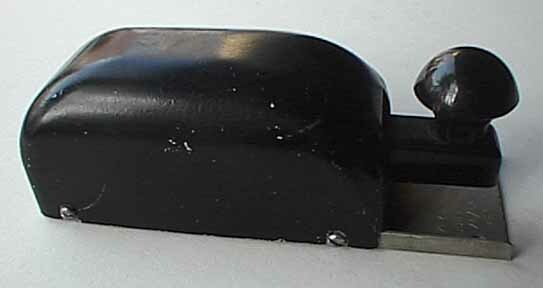 The key is mounted on a black plastic base along with a buzzer and a battery holder bracket. The base is marked: No. 10A/726. Made by Grimmer Wilson, Toronto, Ontario, Canada. 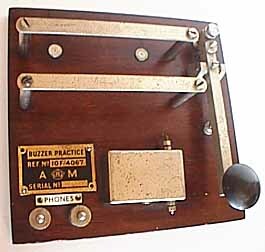 9235 * BRITISH AIR MINISTRY PRACTICE SET:(13KB) This set consists of a telegraph key with a classic British style straight lever. 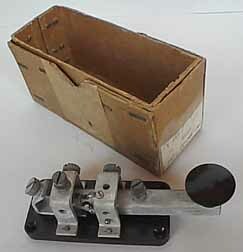 The key is mounted on a wooden base along with a buzzer and a battery holder bracket. The label reads: Buzzer, Practice and carries the Air Ministry logo. 9240 * CANADIAN WESTCLOX KEY AND ORIGINAL BOX:(11KB) This key looks a bit like the British 8 Amp key. In original box marked Z1 ZA/CAN 0977 KEYS Qty 1. 9241 * CANADIAN WESTCLOX KEY:(13KB) Similar to number 9240. 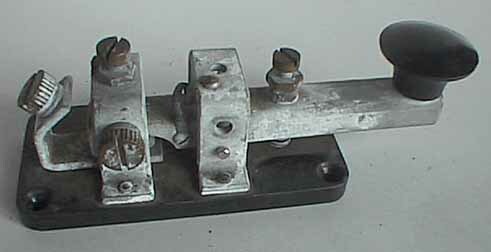 9250 CANADIAN LEG-MOUNTED WESTCLOX KEY:(16KB) This Canadian Westclox key is similar to number 9240 but it is mounted inside a metal cover and supplied with canvas straps that allow it to be strapped to a radio operator's leg. 9251 * CANADIAN LEG-MOUNTED WESTCLOX KEY:(22KB) Similar to number 9250 but the cover is missing. 9280 ** CANADIAN MILITARY TELEGRAPH RECORDER- PLAYER:(33KB)This unusual set records dots and dashes on a moving paper tape and plays them back. I do not have any further information about it. 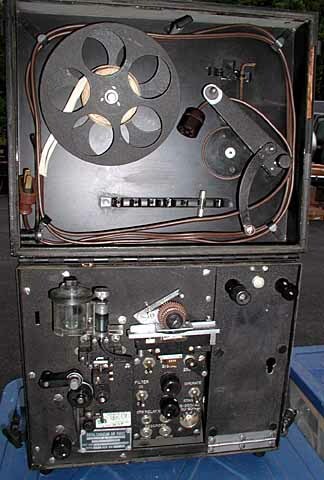 It was shown to me by a collector at the Antique Wireless Association 2002 conference. 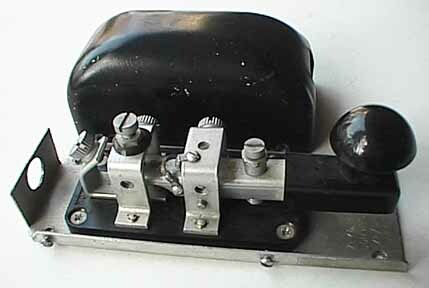 9300 * CANADIAN AIRCRAFT LIGHT BLINKER KEY:(17KB) This round, wall-mounted key was used to blink the upper and lower lights on Canadian and British aircraft. 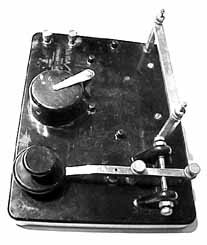 This allowed the planes to communicate visually during periods of radio silence so the enemy could not intercept their communications. The blinking lights were also used to communicate with the landing field. All Spitfire pilots had to learn Morse Code to a speed of 15 words per minute to allow them to communicate.